After Oakland we had our first split event in Sacramento and Davis respectively. Our screening event was at the public library in Sacramento but we wanted to target the UC Davis Primate Research Facility as our demo. The screening was attended by local activists who were really enthused to have us there! After the film was shown the group held a meeting to try and build off the energy of the new people who had come out to the film event, and add to their local efforts. The locals also took the opportunity to ask us for our feedback on some of their ideas for activism in to future, which was flattering and we were happy to share our opinions and their enthusiasm. 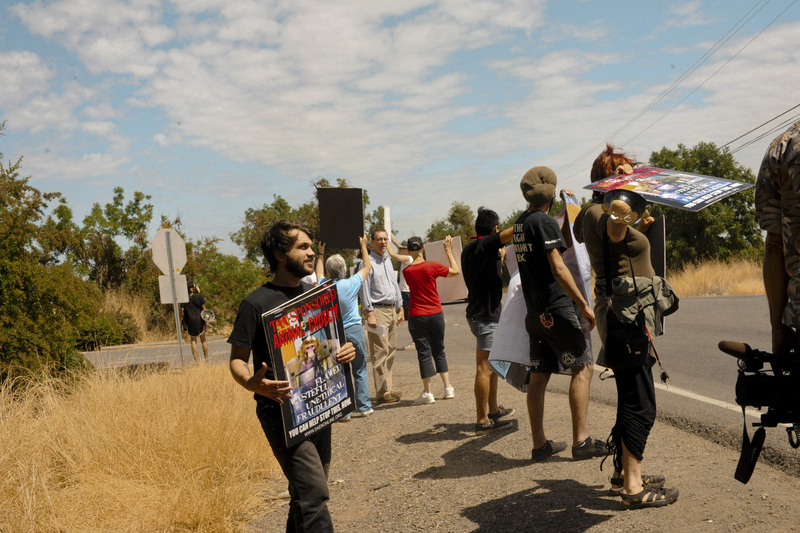 The next day was a really loud and energized demonstration at the gates of the primate facility! Within minutes of us arriving in our van there were 3-4 police cruisers flanking the gates, the road and also following us to where we turned around before finding a place to park. We had not yet experienced police who were so interested before we had even got out of the van! 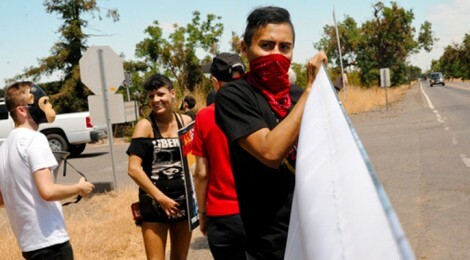 The Davis protest had been the most extensively covered by media to date, with 4 television crews, as well as print media and bloggers on site, it became clear that this was going to be one of those ”big impact” afternoons! 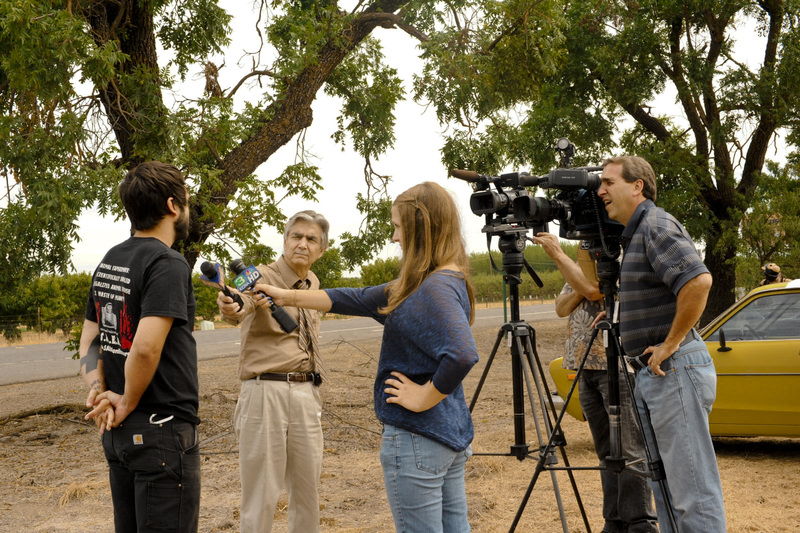 Furthering our reach, SAEN had issued a letter in conjunction with a formal complaint they had filed against UC Davis after a whistleblower inside had come forward with information about specific violations within the facility (a primate that had been hung to death by a bungie cord left in their cage, a primate that had died and was left to rot in their cage until maggots were crawling out of their corpse) which the media was also very interested in. We had all 3 bullhorns out, and all the primate masks, as well as a number of local activists who brought their own signs. We got loud, we got noticed and we got people pumped up! The folks who came out were extremely passionate about animals and we are sure there will be sustained pressure on that facility until it is closed FOR GOOD! HEY DAVIS WHAT DO YOU SAY / HOW MANY PRIMATES HAVE YOU KILLED TODAY?